In United States v. Larkin, 2017 U.S. Dist. LEXIS 10362 (D NV 2017), here, the Magistrate Judge denied a defendant's motion to strike surplusage related to a single count tax evasion indictment. The indictment, the second superseding indictment, is here. Third, the defendant willfully attempted to evade and defeat the tax. criminal case the burden or duty of calling any witnesses or producing any evidence. Some of the other forms have more language to discuss the elements of the crime, such as willfulness. But, generally, the indictments are straight-forward allegations of the elements without detail, even for example the specific affirmative acts of evasion. 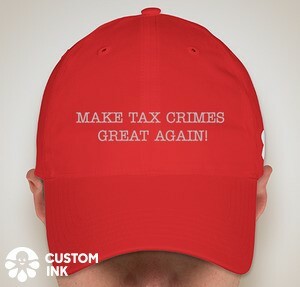 By contrast, indictments of tax conspiracies are often embellished with much of the background of the conspiracy and the overt acts of the conspiracy, often presenting a sinister story indeed. The second superceding indictment (hereinafter the "indictment") charges Defendant Maria Larkin with tax evasion in violation of 26 U.S.C. § 7201. Second Superceding Indictment (ECF No. 135). Paragraphs 1 and 2 of the indictment allege that Five Star Home Health Care, Inc. ("FSHHC") was a business providing home health care and was owned and operated by Defendant Larkin from 1996 through 2009. Paragraphs 3-5 generally describe the Internal Revenue laws that require employers to withhold income, Social Security and Medicare taxes ("Trust Fund Taxes") from employee wages and pay them over to the IRS. Every employer has at least one person who is responsible for collecting, accounting for and paying over the Trust Fund Taxes. If that responsible person willfully fails to pay over the Trust Fund Taxes, she is personally liable to pay a Trust Fund Recovery Penalty equal to the amount of the Trust Fund Taxes. Paragraph 6 of the indictment alleges that FSHHC was required to make deposits of Trust Fund Taxes to the IRS on a periodic basis. Paragraph 7 alleges that Defendant Larkin was responsible for collecting, accounting for and paying over Trust Fund Taxes on behalf of FSHHC. Paragraph 8 alleges that for the years 2004 through 2009, FSHHC withheld Trust Fund Taxes that Ms. Larkin willfully failed to pay over to the IRS. Paragraph 9 alleges that in 2008, the IRS assessed Trust Fund Recovery Penalties against Ms. Larkin for the years 2004 through 2007, and that she subsequently paid the Trust Fund Recovery Penalty for the quarter ending on December 31, 2004. Paragraph 10 alleges that on or about March 20, 2010, Ms. Larkin signed a report of interview Form 4180, acknowledging that she was a responsible person who willfully failed to pay over Trust Fund Taxes for FSHHC from January 2004 through December 2009. Paragraph 11 alleges that on or about June 16, 2010, Ms. Larkin signed a Proposed Assessment of Trust Fund Recovery Penalty (Form 2751) consenting to the assessment and collection of the Trust Fund Recovery Penalties for the last three quarters of 2008 and all of 2009 in the aggregate amount of $541,431. Paragraph 12 alleges that on or about September 13, 2010, the IRS assessed additional Trust Fund Recovery Penalties against Defendant Larkin for the last three quarters of 2008 and all of 2009 in the aggregate amount of $541,431. Paragraph 13 alleges that as of the date of the filing of the superceding indictment, Ms. Larkin owed and had willfully failed to pay Trust Fund Recovery Penalties in excess of $1.6 million. f. Providing false information to the IRS regarding FSHHC's ability to pay Trust Fund Taxes and her ability to pay Trust Fund Recovery Penalties. Second Superceding Indictment (ECF No. 135), ¶ 15. Defendant argues that paragraphs 3 through 13 of the indictment are "surplusage" that should be stricken from the indictment pursuant to Rule 7 of the Federal Rules of Criminal Procedure. While acknowledging that these paragraphs do not state the elements of tax evasion under 26 U.S.C. § 7201, the Government argues that the paragraphs are relevant matters that the Government intends to prove at trial and therefore should not be stricken. Now, why would a defendant fight about what is in the indictment? Even if it is surplusage, so what? Well, most prominently, the indictment often -- perhaps even usually -- is submitted to the jury for its consideration in deliberating guilt or innocence. I will come back to this practice of submitting the indictment to the jury, but first want to conclude the discussion of the Larkin opinion which was addressed to a pretrial motion to strike for surplusage. The relevant law on indictments is in FRCrP 7(c) (contents of indictment) and 7(d) (surplusage). The Rule is here. Rule 7(d) of the Federal Rules of Criminal Procedure states that upon the defendant's motion, the court may strike surplusage from the indictment or information. United States v. Jenkins, 785 F.2d 1387, 1392 (9th Cir. 1986) states that "[i]nsofar as the language of an indictment goes beyond alleging elements of the crime, it is mere surplusage that need not be proved." United States v. Laurienti, 611 F.3d 530, 546 (9th Cir. 2010), quoting the Advisory Committee Notes, states that Rule 7(d) "'introduces a means of protecting the defendant against immaterial or irrelevant allegations in an indictment or information, which may, however, be prejudicial.'" The court stated that the purpose of a motion to strike "'is to protect a defendant against prejudice or inflammatory allegations that are neither relevant nor material to the charges.'" Id. at 546-47 (quoting United States v. Terrigno, 838 F.2d 371, 373 (9th Cir. 1988)). Laurienti held that the indictment's characterization of defendant's sales practices as "unlawful" was relevant because the government sought to prove that the sales as conducted by defendants were indeed unlawful. The court also stated that "[e]ven if the use of the word "unlawful" could be considered prejudicial, we hold that the district court nevertheless did not abuse its discretion because the allegation was relevant. See id. ; accord United States v. Hedgepeth, 434 F.3d 609, 612 (3rd Cir. 2006)." Id. at 547. In Hedgepeth, the Third Circuit held that the test for striking surplusage requires that the material be both irrelevant and prejudicial. The court noted that this conjunctive standard is consistent with the Advisory Committee Notes and decisions of other circuits. 434 F.3d at 612 (citing United States v. Rezaq, 134 F.3d 1121, 1134, 328 U.S. App. D.C. 297 (D.C.Cir. 1998); United States v. Scarpa, 913 F.2d 993, 1013 (2d Cir. 1990); United States v. Poore, 594 F.2d 39, 41 (4th Cir. 1979); United States v. Anderson, 579 F.2d 455, 457 n. 2 (8th Cir. 1978) cert. denied 439 U.S. 980, 99 S. Ct. 567, 58 L. Ed. 2d 651 (1978); and United States v. Bullock, 451 F.2d 884, 888 (5th Cir. 1971)). The elements of attempted income tax evasion under 26 U.S.C. § 7201 are (1) the existence of a tax deficiency, (2) willfulness in attempted evasion of taxes, and (3) an affirmative act constituting an evasion or attempted evasion. United States v. Marabelles, 724 F.2d 1374, 1377 (9th Cir. 1984) (citing Sansone v. United States, 380 U.S. 343, 351, 85 S.Ct. 1004, 1010, 13 L.Ed.2d 882 (1965); and United States v. Conforte, 624 F.2d 869, 873 (9th Cir. ), cert. denied, 449 U.S. 1012, 101 S. Ct. 568, 66 L. Ed. 2d 470 (1980)). As the Supreme Court stated in Boulware v. United States, 552 U.S. 421, 424, 128 S.Ct. 1168, 1173, 170 L. Ed. 2d 34 (2008), "[o]ne element of tax evasion under § 7201 is the existence of a tax deficiency . . . which the Government must prove beyond a reasonable doubt." (internal quotation marks and citations omitted). The indictment in this case could have more briefly alleged that Defendant Larkin was personally liable for the payment of Trust Fund Recovery Penalties which she willfully evaded or attempted to evade by engaging in the acts alleged in Count One. The indictment therefore provides more detail than is necessary to allege that Defendant committed the crime of tax evasion. The Government states, however, that it intends to prove these allegations at trial—preliminarily to proving that Defendant Larkin willfully evaded the payment of the Trust Fund Recovery Penalties. Paragraphs 3-13 of the indictment appear relevant to the first element of a charge of tax evasion under § 7201—the existence of a "tax deficiency." In this case, the alleged "tax deficiency" was Defendant's legal obligation to pay Trust Fund Recovery Penalties. The Court is not persuaded that the allegations in paragraphs 6-13 are prejudicial to Defendant given that the Government states that it intends to prove these allegations through evidence presented at trial. In United States v. Ramirez, 710 F.2d 535, 545 (9th Cir. 1983), the court held that defendant was not prejudiced by providing the indictment to the jury because "[t]he trial court properly instructed the jury both at the outset and completion of trial that the indictment is not evidence against the accused and affords no inference of guilt or innocense." See also United States v. Lyman, 592 F.2d 496, 502 (9th Cir. 1978) (noting that an indictment is not evidence and the jury was properly so instructed); United States v. Utz, 886 F.2d 1148, 1151 (9th Cir. 1989) (court did not err in providing each juror with a copy of the indictment "especially, were, as here, the court cautions the jury not to consider the indictment as evidence"). As Defendant Larkin also notes in her motion, "[w]hether an accusatory pleading should be permitted to go to the jury room is a matter within the discretion of the trial judge." United States v. Murray, 492 F.2d 178, 193 (9th Cir. 1973) (overruled on other grounds by United States v. Cook, 608 F.2d 1175 (9th Cir. 1979)). Within its discretion, the court can redact the indictment to ensure that potentially prejudicial information is not provided to the jury. In Murray, for example, the court omitted the names of other persons charged in the conspiracy from the copy of the indictment that was read and provided to the jurors. Defendant Larkin argues that paragraph 3-5 should be stricken because they state principles of law which is the province of the jury instructions. Defendant does not assert that these paragraphs misstate the law, but only that the indictment is not the place to state general principles of law. This assertion is not entirely correct because the indictment must allege the essential elements of the charged crime which will also be set forth in the jury instructions. Defendant's point is well taken, however, that the indictment is not the place for the exposition of all applicable or relevant law. Although paragraphs 3-5 are relevant, they could mislead or confuse to the jury if they differ in some respect from the jury instructions. The District Judge may therefore wish to exercise his discretion to not provide these paragraphs to the jury. Now, I want to go back to the common practice of submitting the indictment to the grand jury. The indictment is drafted by the Government to state its best case, within the requirements of Rule 7(c), and give the defendant fair notice of the charge(s). But, the trial court instructs the jury on the nature of the charges (including the elements and various other matters related to the trial and jury verdict, such as burden of proving the elements beyond a reasonable doubt). So, what is the purpose of submitting the indictment to the jury at all? That [redacted] version was twenty pages long, and contained sections that outlined the general mortgage fraud scheme, described the fraudulent preparation of particular loan applications, and summarized the various charges against Esso and his co-defendant. The jury began deliberations again the following morning. At about 2:55 p.m., the jury returned a verdict convicting Esso on all counts. n5 Indeed, while it is permissible, as we have noted above, to send the indictment into the jury room, the practice is hardly mandatory, and not all trial judges follow it, particularly when the indictment does not merely state the statutory charges against the defendant, but additionally contains a running narrative of the government's version of the facts of the case, including detailed allegations of facts not necessary for the jury to find in order to address the elements of the charged offenses. In most cases, the judge's instructions regarding the issues to be addressed by the jury and the elements of the offenses charged, which may include a reading of the legally effective portions of the indictment, will more than suffice to apprise the jury of the charges before them. In short, I don't see the advantage to the defendant the submission of the indictment to the jury offers. Practitioners should, I think, generally strive to have the trial court exercise its discretion to not have it submitted or, if that won't work, to redact out as much as possible. I suppose that, if the indictment is the bare bones type suggested in the DOJ CTM for tax evasion, there might not be any harm. But, if the indictment is flowered up as in Larkin and as is the case typically when tax conspiracies are charged, then the defense should strive to not have it submitted to the jury. My limited research into other courts' views on submitting the indictment to the jury confirmed that most courts say it is in the discretion of the trial court. Robert J. Anello and Richard Albert, Keeping the Indictment Out of the Jury Room, 248 NYLJ No. 26 (8/7/12), here.